This is old version Tinder 5.3.4 apk for Android, you can install it if you want to downgrade or install old app. It is top Communication apps from Tinder. If you cannot trust everyone, how everyone can trust you? This basic principle is Tinder big advantage compares to many competitors. Swiping is basic way to find people that match your criteria, but advanced search will narrow result accurately. When swipe right, you decide to put interest on that particular account and wait for further confirmation. Another feature is social media integration. Basically, Tinder uses Facebook as main platform to assist in user registration. After getting mutually interested user, you can start for private chatting and only two users can see that conversation. To expand chatting feature, developers buy messaging company. This app has been downloaded for more than millions time and won award as the best app. Tinder offers free and paid mode for users. Free user has limited swiping and accessibility for more others. Paid mode will expand capability then can swipe unlimited. 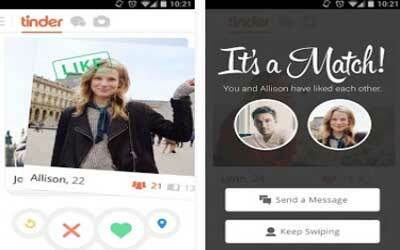 Furthermore, Tinder for Android changes the way people see at dating or matching app. FREE and takes only 60 seconds to set up. There are no long forms or questions to fill out. Download Tinder now and make your first match today. You decide who can message you: no one can message you on Tinder unless you choose to swipe right on their profile (and they on yours). That means you only get messages from the people you like and that like you back. And, you can always unmatch with someone at any point. Tinder works: 26 million matches are made every day on Tinder.